This week’s Thursday craft was on Saturday. 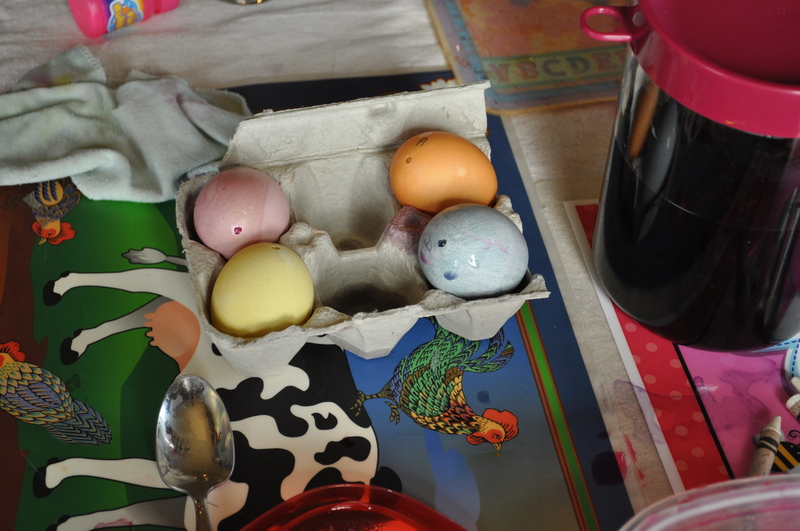 For the past few years, just by chance, we have painted Easter Eggs on the Saturday of Easter weekend. Unplanned, it has kind of become a tradition. This year the change was that I was determined to use natural dyes. 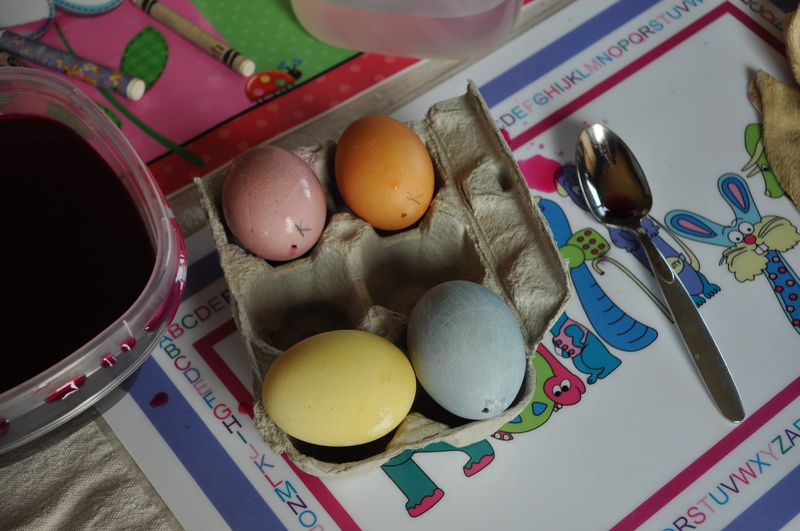 It took a lot more prep work on Mommy’s part but I think the eggs look much better, and there was a much bigger sense of achievement – well at least on my part. The first thing I did was blow out all the eggs. Many people just use hard-boiled eggs but we like to keep ours. Every year I let the girls pick their favourite couple of eggs and we add them to our basket. Every year our basket grows a bit bigger and they can see how they progress throughout the years. It takes a little time, and a long of breath, to blow out the eggs but I feel it is definitely worth the effort. 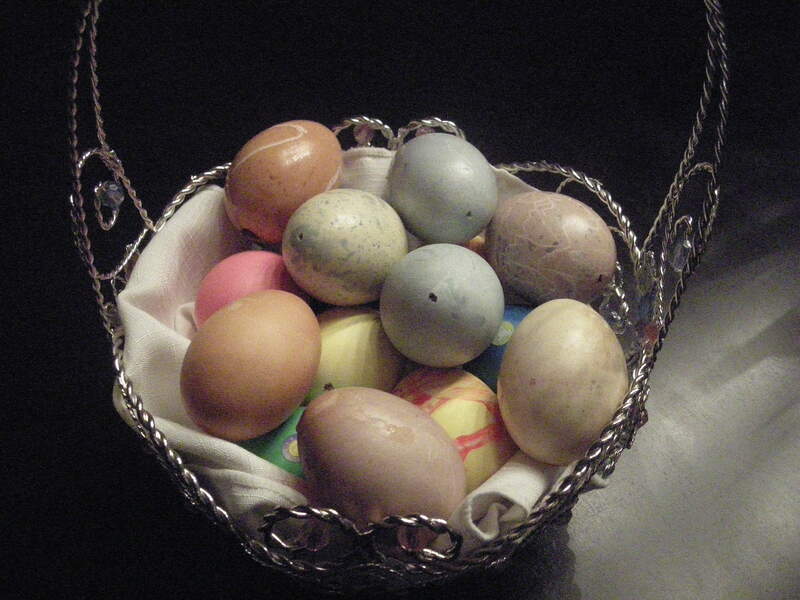 To blow out Easter eggs use a straight pin to make a hole in both ends of each egg. The bigger the holes the easier they are to blow out but you will then have bigger holes in your eggs. I like to save all the egg that I blew out and then we have omelets for lunch. After you blow them out make sure to rinse them and let them dry overnight. Be careful when putting them back in to the egg carton. If there is residual egg they can stick to the carton and ruin all your hard work. Next I had to prepare the dyes. Gord’s Grandmother use to dye Easter eggs all the time so I called her and asked her what she used. She told me to use onion skins, and she even helped by saving her’s for me for a week (she goes through a lot of onions). I also found a Martha Stewart website that outlines what to use for a variety of colours. We used onion skins for a browny/red, turmeric for yellow, beets for pink and red cabbage for purply/blue. I followed most of the direction on the website but modified slightly as I was using blown eggs and not hard-boiled eggs. All worked pretty well but I had trouble getting the turmeric to dissolve. Next year I am going to try boiling the turmeric in the water to see if it helps. After everything was made up I assembled all our supplies on the table, which was covered in our craft drop sheet and place mats. 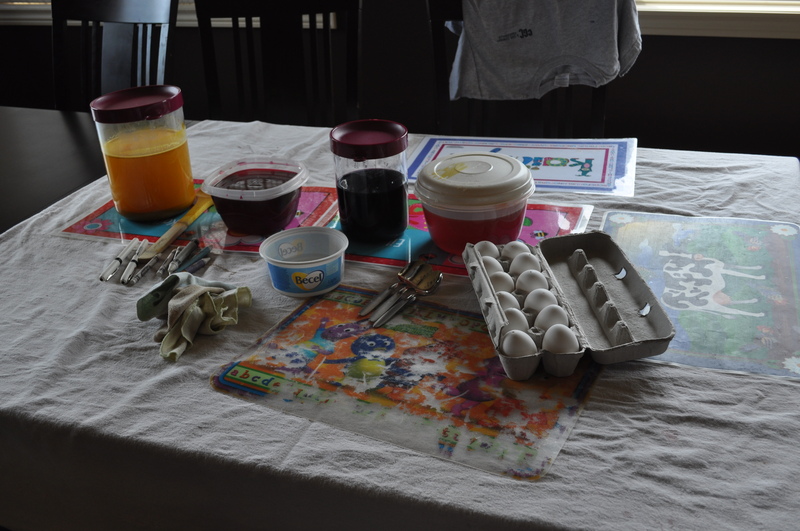 We had our dyes, our eggs, spoons, pens, white crayons, and white vinegar with old baby face cloths. Every child had to wear their paint shirt. Friends who live in Ottawa were in town so their daughter Anika joined us for egg decorating. The more the merrier – there was lots of dye to go around. The first thing the kids had to do was clean their eggs. 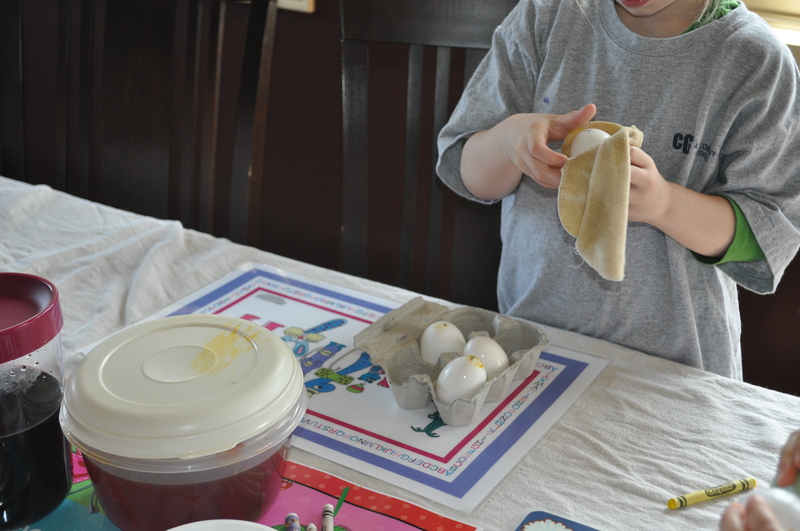 They used white vinegar and an old baby face cloth to gently wipe off the eggs. This creates a clean surface and allows the eggs to dye evenly. I put their first initial on the bottom of each of their eggs so they would know which ones were theirs. Then they each had a white crayon and they gently created any pattern they wanted on their egg. They key to this is being gentle enough not to break the egg but pushing hard enough to leave the wax pattern on the egg. Eileen needed some help from Mommy and Daddy and hers ended up being the clearest pattern once they were dyed. Finally they dyed the eggs. I had four colours and they each had four eggs so they put one in each colour. We covered them with object to keep them submersed in the dye. If you do hard-boiled eggs you don’t have to worry about that because they easily sink. We left the eggs in the dye for approximately 20 minutes. Then we used the spoons to take them out and carefully place them on the egg carton. 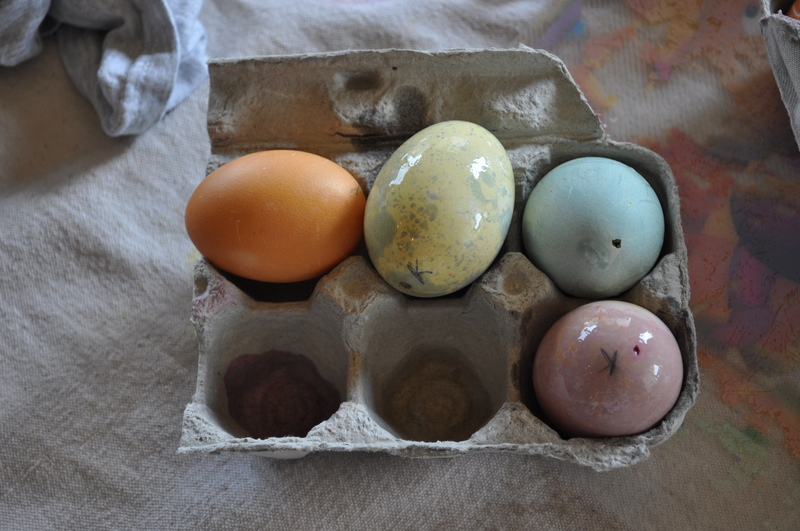 Anika’s mom, Michelle, gave us a great suggestion to make marbled appearances on our eggs. We took a bit of each dye and put it in a jelly jar and added a small amount of vegetable oil. The girls also added a few more crayon marking to their dried eggs. We then added some of the eggs to the jelly jars. This created a cool marble effect. The best was the blue added to already yellow eggs. A cool appearance we will definitely play around with more next year. Our final step was to add our eggs to our basket with the eggs from past years. It is really neat to see the progression year to year! If anyone has any other suggestion on how to get great natural colours on your Easter eggs, comments are very much welcome! Also what are your suggestions for us to add to the designs of our eggs? 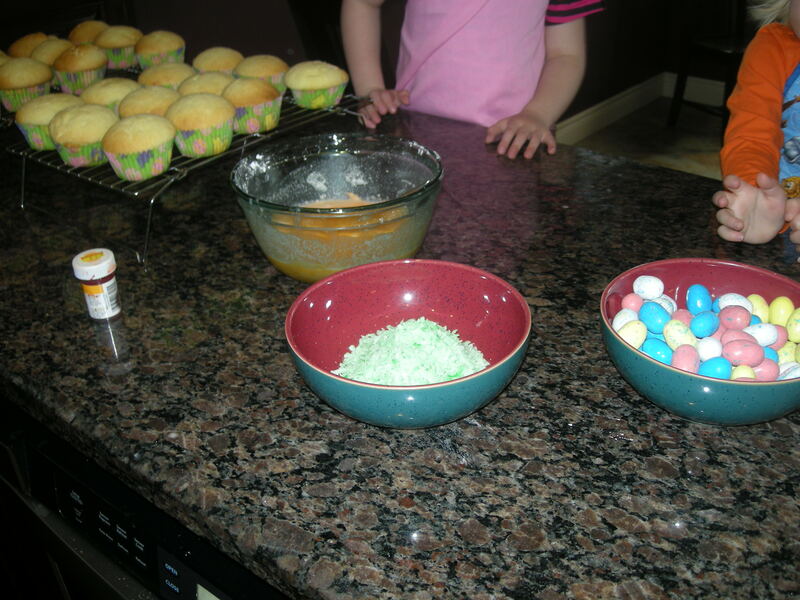 Tomorrow is Kaitlyn’s last day of school before Easter so today we were making our treats to take for her class. Cupcakes are always a favourite and easy for a teacher to distribute. I am a bit proponent of healthy lunches and snacks at school, but even I agree there are special days that a sugary treat is fun. 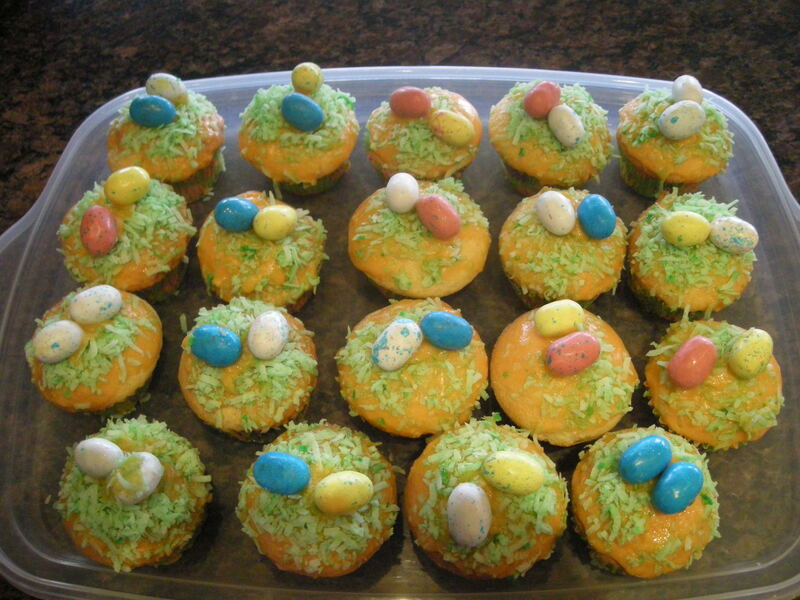 This year we decided to make Easter Basket Cupcakes. They seemed easy enough and I was able to find all the ingredients. I found some cute easter baking cups in the grocery store to use for our cupcake liners. 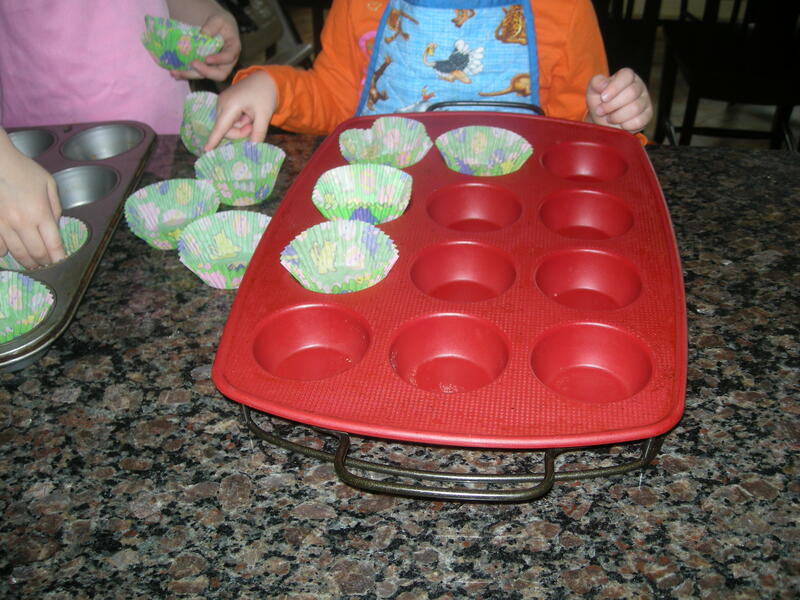 Putting the liners in the muffin tin is an easy task that any child can safely do – just make sure they only have one liner for each cup. The girls solved this problem all on their own as Kaitlyn began to separate the cups and Eileen put them in the tin. The cupcake recipe in the Food Network link is very easy to make. Everything mixes together in a food processor. 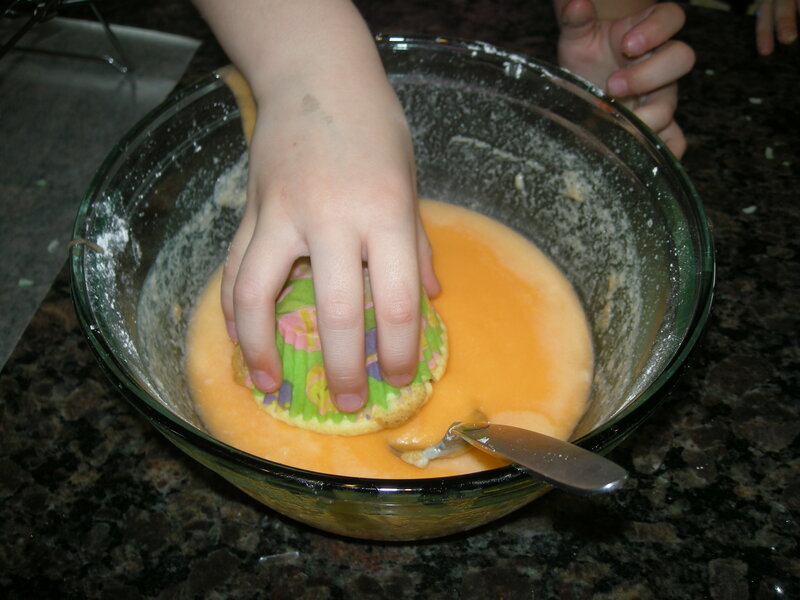 I you have kiddies around make sure you have a food processor that won’t work unless the lid is on and ALWAYS watch them around any kitchen appliances. After it was all mixed the girls wanted to fill their own muffin tins but after a couple they got frustrated and Mommy finished filling them. The best part of any cupcake adventure is decorating. You need three things to decorate cupcakes like ours: a basic glaze tinted your favourite colour, green shredded coconut & chocolate eggs. You can use any glaze you like but if you need a recipe we found one just by googling Basic Cake Glaze. 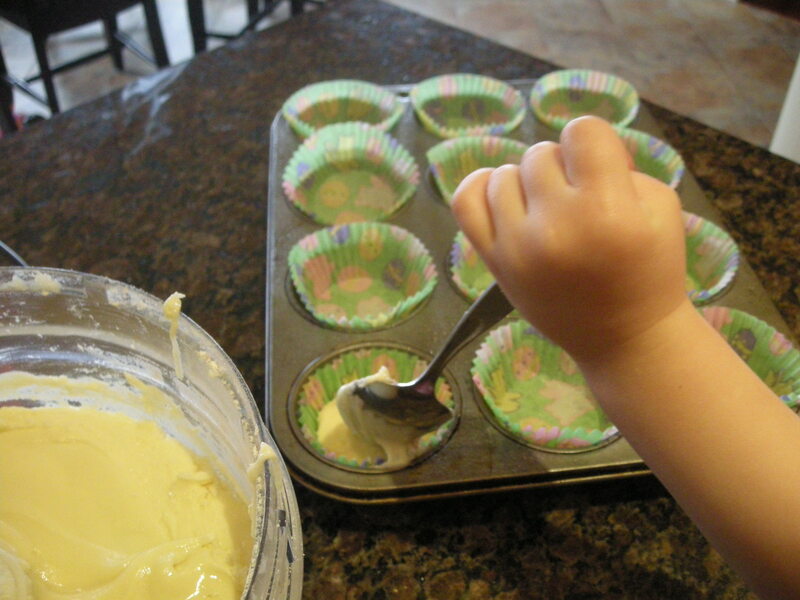 You will need to add considerably more milk to make it runny enough to dip your cupcakes in – just eye ball it and add a little milk at a time. The key to dying your glaze is adding the food colouring to a liquid (in this case the milk) before adding it to the dry ingredients. This recipe gave us just enough for all our cupcakes. To dye your shredded coconut put it in a ziploc bag with a few drops of liquid food colouring. We use an entire 200g bag of flaked coconut. Shake it up really good and add more food colouring to get the desired colour. For chocolate eggs we used Whoppers Robin Eggs. We found with this we could only get two eggs to stick on top of the cupcake. I also noticed M&M Easter eggs in the grocery story and they might work better if you wanted to add 3 eggs. Get all the ingredients ready before you start. I made sure I had everything ready before I got the girls started. 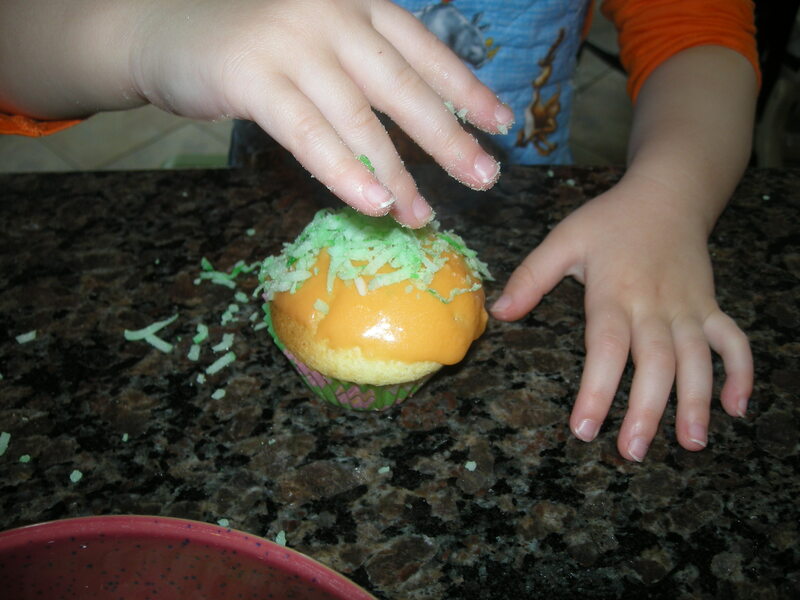 Step 1: Dip the Cupcake in the icing and let it stop dripping before turning. 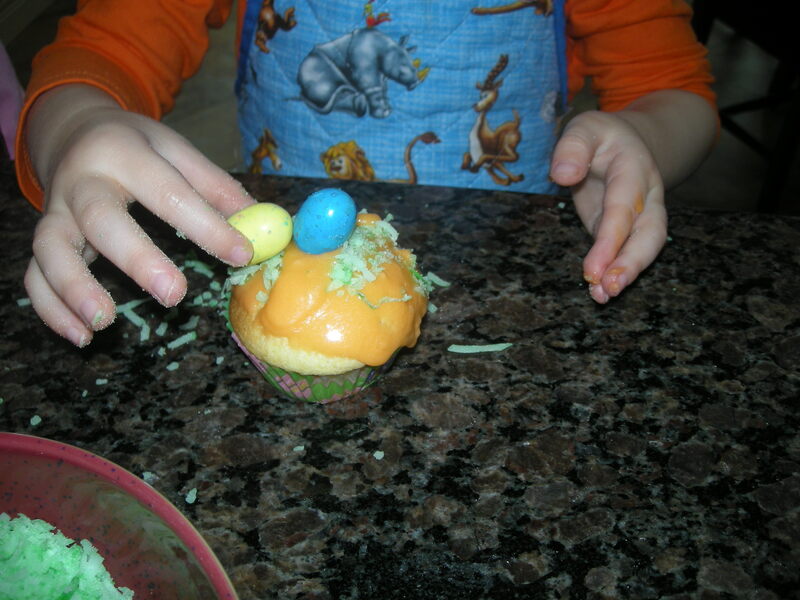 Step 3: Use a bit of icing to secure your eggs on top of your cupcake. Let me know if you have any success with these cupcakes. I am working on trying to add a link-up so check back often. A few weeks ago I found these really cool Bunny Napkin Rings we could make for Easter Dinner. The instructions seemed pretty easy but I would have to find Pony beads. After checking out Walmart and Michaels I realized finding pink pony beads, not mixed with other colours would be a challenge. I found a number of online beading sites but they were all American and had crazy shipping rates. I thought I found a Canadian company that had exactly what I needed at BeadFx. I placed my order and waited for everything to come in. The beads arrived and they were the perfect colour but they were too small. In hindsight I should have called and talked to a representative to make sure I ordered the right beads. I have not given up entirely but I think this will be a better craft for next year. That also gives me a year to find the right beads. If anyone knows of a great company that ships pony beads to Canada for a reasonable price let me know. So we needed a new craft for this week. My goal was to find something easy to make that the girls could do by themselves (or at least mostly by them selves). I can’t remember how but I came across a site with a number of great crafts to make with paper plates. 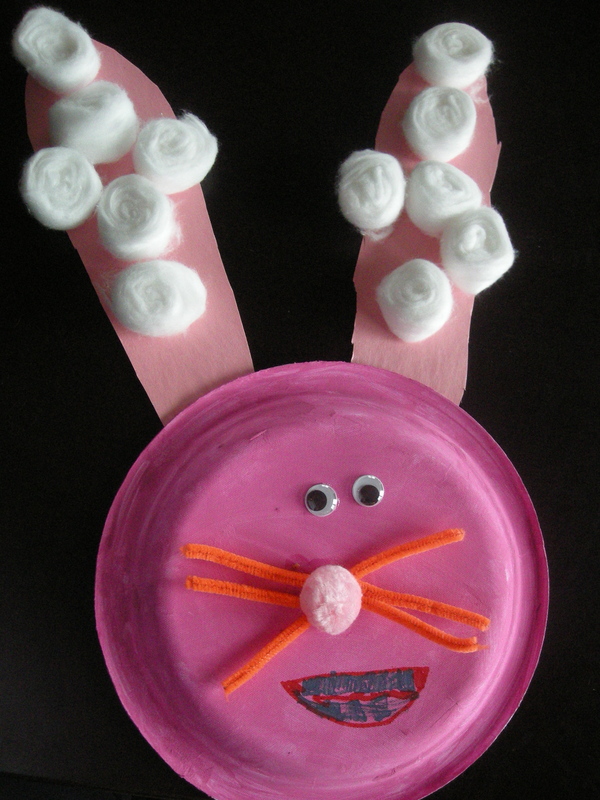 Upon further investigation I found YouTube video showing how to make simple Paper Plate Bunnies. The best thing about this craft is that all the supplies are normal things that most people may have in their house and a craft bin. 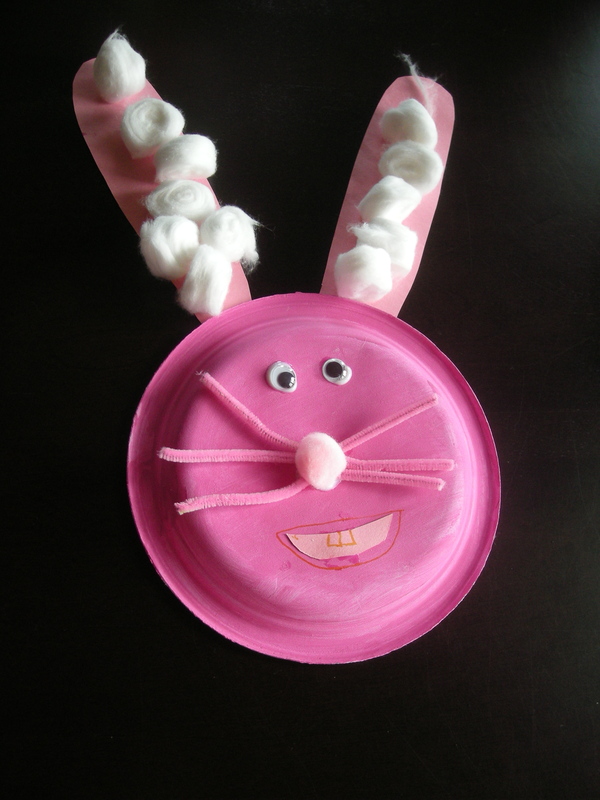 To make one similar to us you will need: a paper plate, pink paint, pink construction paper, cotton balls, goggly eyes, a pink pom pom, pipecleaners, glue, markers and scissors. Kaitlyn was able to make her bunny all by herself and personalized it a bit for herself. I had to cut out Eileen’s ears and her pipcleaners but she did the rest herself. So last week when we were making our Easter Lilies Kaitlyn asked if we could make pop up puppets, actually she pretty much begged. The results = this Thursday’s craft. This one was another 2 day craft. It doesn’t take that long but there is a lot of paint and glue drying time needed. The most difficult thing with this craft was gathering all the supplies. 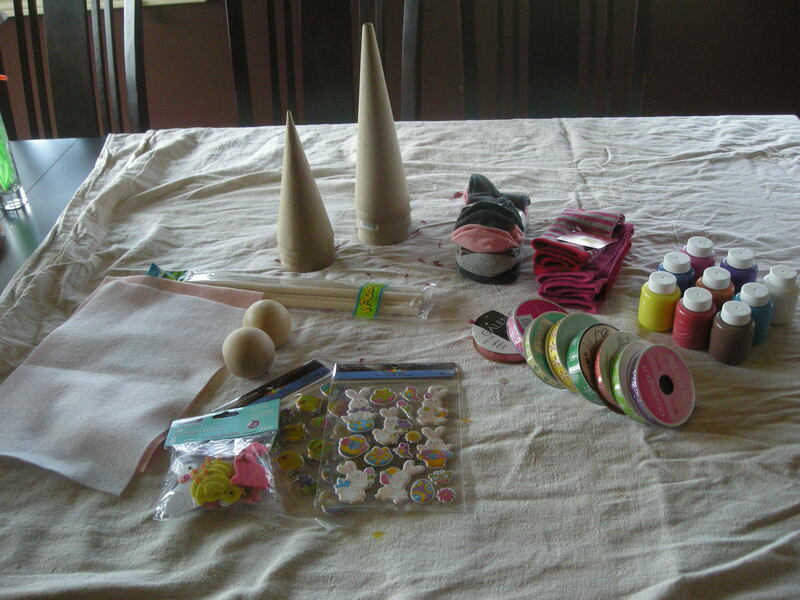 Paper mache cones – these are difficult to find at this time of year but we found some online through Stockade. We found the 7″ ones worked best. Wooden balls or styrofoam balls. We used wooden but styrofoam would probably have been easier. Before beginning an adult needs to cut off the end of the cones. Cut just enough to fit the piece of dowel. Get everyone ready for painting. For us this means the drop sheet is on the table, paint shirts are on and hair is tied back. You can use simple tempra paints to paint the cones. We (meaning Mommy) prefers to use these when we can because they are very easy to clean up when (not if) messes occur. Paint your cones a solid colour. You may need two coats of paint. Mommy thought pink bunnies would be best for Easter but Kaitlyn declared that she doesn’t like pink. We couldn’t find orange socks so she settled for red socks with an orange base – an it was perfect for her. While the kids are painting their cones a parent can glue the doweling onto the balls. We managed to glue the wooden doweling to the wooden ball with simple tacky glue but you may have to use wood glue. If you can find balls with holes to push the dowel in it may be easier. Syrofoam would probably have worked well also but I am not sure how well they would glue together. We left our cones and our heads to dry overnight. In the morning it was assembly time. First the girls decorated their cones with a variety of Easter stickers. Next they pushed their heads into their socks. I helped them tie a ribbon around the neck to keep the sock in place. We then determined how far we wanted the bunny to pop out of his hole and we cut the remaining portion of the sock. 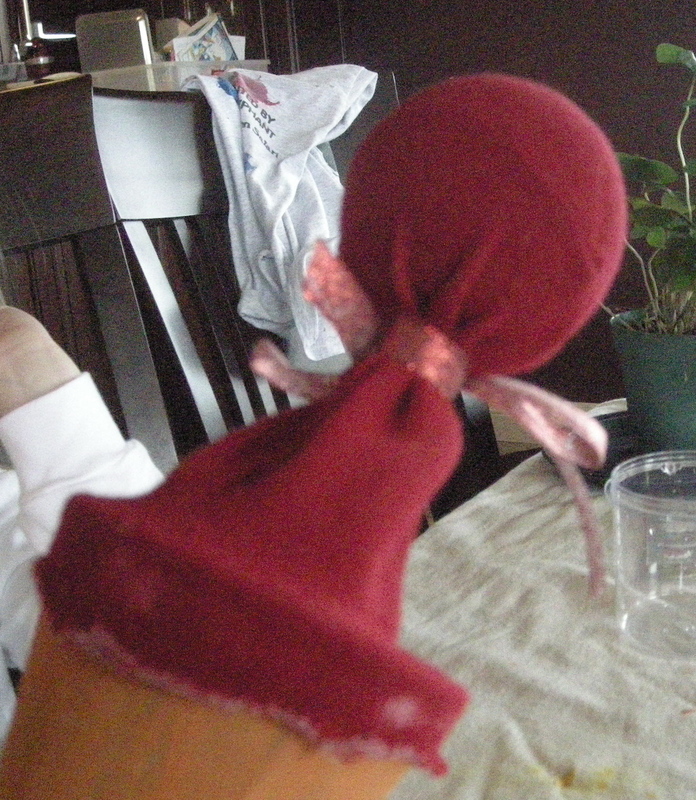 Use the glue to glue the sock to the opening of the cone and let it thoroughly dry. The final stage is the decoration stage. The girls added ears, eyes and noses on their bunnies. Very cute pop-up bunnies. 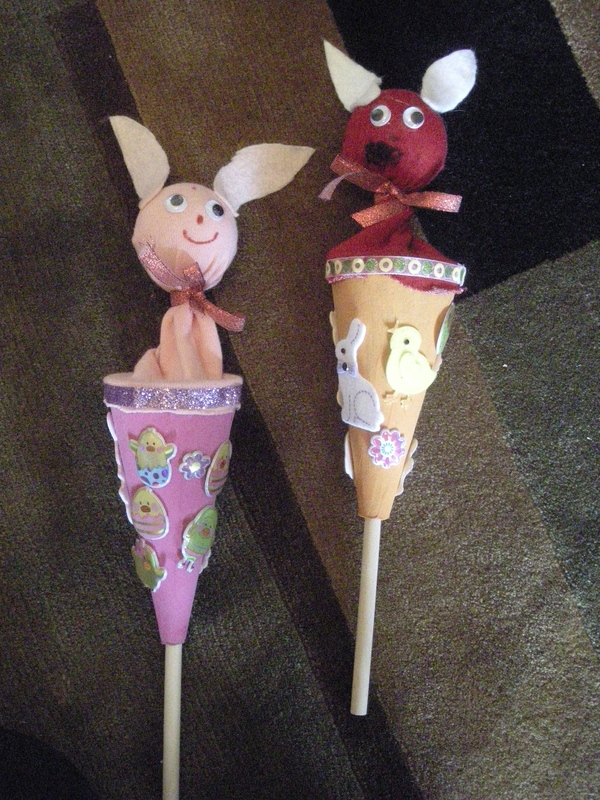 They will work great with the puppet theatre Grampa is making them for Easter.